“Iran’s annual funding of Hezbollah in Lebanon to attack Israel: 1 billion dollars. Hezbollah cross-border attack tunnel: A few million dollars. Operation Northern Shield, which the IDF launched on 4 December 2018, aims to locate and destroy Hezbollah (terror)tunnels that cross the Blue Line from Lebanon into northern Israel. The operation is part of the ongoing Iran–Israel proxy conflict. The Operation Northern Shield, following intelligence surveillance of a number of years. is underway via a well thought-out plan that combines intelligence exposure, engineering-based targeted action, and cognitive and diplomatic activity, all of which demonstrate clearly to Lebanon in general and Hezbollah in particular the aims and scope of the operation. While Operation Northern Shield is still ongoing Israel’s attention is currently focused primarily on preventing Hezbollah to produce and convert rockets into guided long range precision missiles on Lebanese soil. Probably both Israel and Hezbollah don’t have big interest to escalate the situation now – the future is different issue. United Nations Interim Force in Lebanon (UNIFIL) acknowledged the existence of four tunnels near the Israel-Lebanon border, and can confirm that at least two of the tunnels cross the Blue Line” in violations of UN Security Council Resolution 1701, which helped end the Second Lebanon War in 2006. The Russian embassy posted a tweet saying that there is “no doubt that Israel has the right to protect its national security, including to prevent the illegal entry of anyone into the country.”…“we hope that the actions taken for this purpose will not conflict with UNSC Resolution 1701.” Also the United States “strongly supports Israel’s efforts to defend its soverignty,” US National Security Advisor John Bolton wrote on Twitter. On 11 December 2018, the IDF located a third tunnel crossing into Israel. On 16 December 2018, the IDF located a fourth tunnel crossing into Israel, and that as the tunnel had been rigged with explosives anyone entering it from the Lebanese side would be risking their life. According to a senior IDF officer, most of the tunnels in the north exposed so far were “five star tunnels,” of the kind Hamas could only dream about. They had ventilation ducts and electric connections, and some of them had telephones. Some of Hezbollah’s tunnels were dug to a depth of more than 49 yards. They were ten feet wide and almost eight feet high (IDF spokesman, December 27, 2018). The tunnels Hezbollah burrowed are meant to facilitate the movement and infiltration into northern Israel of hundreds of its fighters as part of its well-established military doctrine that calls for “the conquest of the Galilee.” and its aim is that during the next war, Hezbollah would invade the northern Israeli Galilee region and conquer it. Hezbollah’s operational plan also includes the construction of facilities to launch massive missile attacks on population centers and strategic sites. From Hezbollah’s perspective, the aerial attacks would attract the entire attention of Israel’s military, thereby simultaneously enabling Hezbollah to activate its plan for “the conquest of the Galilee” using its special forces. Hezbollah has long history of creating underground facilities such as tunnels, this was evident during the 2006 Lebanese war. However then they served for defensive purposes i.e. moving troops etc but now the tunnels were intended for offensive objectives. The idea of the tunnels is to transport Hezbollah elite units e.g. with motorcycles into Israel, to make ambushes, kidnap soldiers and terror civilian communities – the same idea which Hamas developed in Gaza before Israel-Gaza conflict in 2014. Original idea came from lessons learned from Viet Cong activities in -60’s and -70’s. Hamas shared their experiences with Hezbollah with Iranian financial support. IDF started searching for Hezbollah tunnels into Israel in 2013 after residents of northern Israel reported hearing sounds of digging, but failed to find anything. After the 2014 Israel–Gaza conflict, which saw numerous tunnels dug by Hamas from the Gaza Strip into Israel being uncovered and being utilized in several attacks, the IDF renewed its search for Hezbollah tunnels in northern Israel, and this time found indications that such tunnels existed. A laboratory made up of soldiers from technology and intelligence units was formed to investigate it, based on a similar laboratory investigating Hamas tunnels in southern Israel. A variety of seismic sensors and radar systems were used to locate the tunnels. The operation was planned two and a half years in advance. After realizing that Hezbollah’s tunnels would need to be dealt with in 2015, a team of IDF military engineers, intelligence officers, and technology experts determined that plans should be made for destroying the tunnels. Senior officers in the IDF Combat Engineering Corps realized that the hard, rocky terrain of northern Israel, as opposed to the soft, sandy terrain of the area where Hamas tunnels were dug in the south, would pose a challenge that the IDF was not accustomed to. The impact of of Operation Northern Shield is significant on Hezbollah’s plan to establish a credible ground threat against Israel. The operation makes clear the improved IDF’s intelligence and detection capabilities and destroying the tunnels as well building the security barrier or wall Negating this Hezbollah capability solidifies Israel’s military superiority and widens the gap between it and the organization in a manner that could affect the balance of deterrence, which has remained stable since 2006. By refraining from punishing the organization for these violations, beyond By taking only preventive actions against the tunnels, and not punish Hezbollah or to make destroying airstrikes nor land operations, Israel is signaling its intent to maintain the stability and calm along the border. Hezbollah, for its part, is embarrassed and lack of interest in military escalation against Israel at this stage, due to its continued military involvement in the war in Syria, which thus far has taken a heavy toll in resources and casualties (about 2000 dead and approximately 8,000 wounded, and families that need to be supported). In fact word operation describing ”Northern Shield” is an overstatement as the effort consists of engineering activities performed entirely within Israeli territory, with no fire and no maneuvering elements. According IsraelDefense in internal discussions within the defense establishment, quite a few speakers thought it would have been better to avoid destroying the tunnels at this time. The proponents of that view reasoned that it would be better to allow Hezbollah to invest more and more energy in the tunnels, of which the IDF was fully aware, and destroy the tunnels in the future, only in the event of a war – or turn them into a trap. While Operation Northern Shield is still ongoing is Israel’s attention currently focused primarily on the project run by the Iranian Revolutionary Guards and Hezbollah to produce and convert rockets into guided long range precision missiles on Lebanese soil. This is also the main explanation for the Israel Air Force campaign during last three years to bomb the supply lines from Iran via Syria to Hezbollah. Only last year there was over 200 IAF attacks in Syria. Recently civilian airliners have carried in direct flights from Tehran to Beirut advanced weaponry such as Global Positioning System (GPS) components that could upgrade Hezbollah’s arsenal of unguided heavy rockets into precision-guided munitions (PGMs). Bosnia-Herzegovina (BiH) is an artificial administrative creature made by foreign powers in Dayton agreement on 1995. It has two political semi-independent entities (federal units) – Serb dominated Republika Srpska (RS) and Federation of Bosnia and Herzegovina (FBiH) inhabited mainly by Croats and Bosniacs. The outcome has been some kind of confederal arrangement set up in Dayton, which provides for an extremely limited central government and broad and virtually unfettered self-government for the RS as well for the FBiH. General elections were held in Bosnia and Herzegovina (BiH) on 7 October 2018. The general election was seen as an indicator of Bosnia’s future direction: moving toward integration in the European Union and NATO or driven by entrenched rivalries and friction. Pro-Russia Serb leader Milorad Dodik won a race to fill the Serb seat in Bosnia’s three-member presidency, deepening ethnic divisions in the country that faced a brutal war some 25 years ago. Earlier Dodik has prevented Bosnia-Herzegovina from recognizing Kosovo, and opposes joining NATO. After elections Dodik said, that“The will of the people leaves no doubt what they want,” adding that voters “punished” his opponent for his “servile policies toward the West.” Ivanic conceded defeat. The country – Bosnia and Herzegovina (BiH) – consists of a Serb-run Republika Srpska (RS) entity and a Muslim-Croat entity Federation of Bosnia and Herzegovina (FBiH) with joint institutions in a central government. Voters cast ballots for the three-person Bosnian presidency, the Serb president, and the two entities’ parliaments and cantonal authorities. Voters elected the national Presidency and House of Representatives, as well as the Presidents and legislatures of the two entities – Federation of Bosnia and Herzegovina(FBiH) and Republika Srpska (RS) – and the legislatures of the ten cantons of the federation of Bosnia and Herzegovina. The 10 cantons of the Federation of Bosnia and Herzegovina serve as the second-level units of local autonomy and federal units of the of FBiH while the other political entity of BiH, the Republika Srpska (RS), has a centralized government and is divided directly into 63 municipalities. In addition the ethnically diverse Brčko District is a division of its own under the direct jurisdiction of BiH. A total of 3,352,933 voters were eligible to vote at 5,794 polling stations at home and abroad for some 53 parties, 36 coalitions, and 34 independent candidates that have been confirmed as eligible to run by Bosnia’s Central Election Commission. A total of 3,352,933 citizens were registered to vote: 2,092,336 in the FBiH and 1,260,597 in the RS . Turn out at the level of BiH was 53.36%; FBiH 51.25%; RS 57.30%. Despite international community’s state building efforts in Bosnia the country is splitting parts; the aim for this artificial creature designed in Dayton agreement was a multi-ethnic state with EU perspective. Bosnia is now even more divided, with less national identity, 20 percent of population living under the poverty line, with a nightmare triple administration plus international supervising making the country one of the worst place in Europe to do business, even as it seeks to join the European Union. The EU has demanded that if Bosnia wishes to join to EU, it must create a stronger central government. Negotiations – led by EU and U.S over constitutional changes to strengthen the central government have been long and unsuccessful. According Stephen Karganovic during the electoral process some Western political manipulation took place to influence its outcome as credible claims have been made that Republic of Srpska’s main opposition coalition alliance is being funded by the US and UK.. USAID and other outfits tied to the US and British governments were injecting funds into the Republic of Srpska, particularly the media and political groups friendly to their agenda, in order to detach the Republic of Srpska from “malign Russian influence.” As a result, the Republic of Srpska is in the throes of the second round of the color revolution which was originally attempted and failed four years ago at the time of the previous general elections in 2014. Dodik’s win in elections 2018 will probably mean the restoration of the loose confederal arrangement originally envisaged and agreed upon in Dayton would be regarded by Serbs as satisfactory. Such a system would leave them with an ample degree of self-government in their own virtually independent state. As they could largely ignore the unpalatable government in Sarajevo, and that government would have little effective control over them. For Western powers, NATO and EU the outcome of elections 2018 probably will be there will be a delay of color revolution in the RS. For Bosnia the outcome might be moving from failed state towards dissolution of BiH. In addition, thousands of individuals from scores of countries are included in the Treasury Department’s list of Specially Designated Nationals who are effectively blocked from the U.S.-dominated global financial system. Many of those designated are either part of or closely linked to their countries’ leadership. From a U.S. perspective, each one of the economic entities is targeted for a good reason be it human rights violations, terrorism, crime, nuclear trade, corruption or in the case of China, unfair trade practices and intellectual property theft. America’s global supremacy has been made possible not only thanks to its military power and its alliance system but also due to its control over the plumbing of global finance and particularly the broad acceptance of the dollar as the world’s reserve currency. The unique status of the U.S. currency has anchored the global financial system since World War II. Any transaction done in U.S. dollars or using a U.S. bank automatically brings the trading parties under American legal jurisdiction. When the U.S. decides to impose unilateral sanctions, as in the case of Iran, it essentially tells the world’s governments, corporations and individuals they must choose between halting business with the sanctioned country or be shut off from the world’s number one economy. This is a powerful stick. Not many companies or banks can afford to give up on the U.S. market or be denied access to U.S. financial institutions. Revisionist countries that wish to challenge the U.S.-led system see this as an affront to their economic sovereignty. Which is why both Russia and China have developed their own versions of the Society for Worldwide Interbank Financial Telecommunication (SWIFT), the global network that allows cross-border financial transactions among thousands of banks. Both countries are also urging their trading partners to ditch the dollar in their bilateral trade in favor of indigenous currencies. This month Russia was quick to recruit Turkey into the anti-dollar bloc, announcing it would back non-dollar trade with it, after a financial feud between Ankara and Washington broke out. China for its part is using its trillion-dollar Belt and Road Initiative as a tool to compel countries to transact in yuan terms instead of dollars. Pakistan, the number one recipient of Belt and Road money, and Iran have already announced their intention to do just that. Last month’s BRICS (Brazil, Russia, India, China, South Africa) summit in Johannesburg was a call to arms against the dollar hegemony with countries like Turkey, Jamaica, Indonesia, Argentina and Egypt invited to join in what is known as “BRICS plus” with the goal of creating a de-dollarized economy. The main front where the future of the dollar will be decided is the global commodity market, especially the $1.7 trillion oil market. Ever since 1973, when President Richard Nixon unilaterally severed the U.S. dollar from the gold standard and convinced the Saudis and the rest of the OPEC countries to sell their oil only in dollars, the global oil trade has been linked to the American currency. This paved the way for the rest of the commodities to be traded in dollars as well. The arrangement served America well. It created an ever growing demand for the greenback, which in turn enabled consecutive U.S. governments to freely run their growing deficits. Not anymore. Because so many of the members of the anti-dollar alliance are exporters of commodities they no longer feel that their products should be either priced by a dollar-denominated benchmark like WTI and Brent or be traded in a currency they no longer crave. For example, when China buys oil from Angola, gas from Russia, coal from Mongolia or soybeans from Brazil it prefers to do so in its own currency and thereby avoid unwanted exchange rate fees on both sides of the transaction. This is already beginning to happen. Russia and China have agreed to transact some of their traded energy in yuan. China is pushing its main oil suppliers Saudi Arabia, Angola and Iran to receive yuans for their oil. And last year China introduced gold-backed futures contracts, dubbed “petro-yuan” in the Shanghai International Energy Exchange – the first non-dollar crude benchmark in Asia. The gradual acceptance of digital currencies, backed by blockchain technology offers another way for the revisionists to ditch the dollar in their trading. The Russian central bank indicated that it was considering launching a national cryptocurrency called “cryptoruble” and in the interim it helped Venezuela’s launch of its own cryptocurrency, the “petro,” which is backed by the country’s vast oil reserves. Now BRICS members are discussing a BRICS-backed cryptocurrency. All of those actions and others point to one direction: In the coming years the dollar will be facing a barrage of attacks with the goal of eroding its hegemony and the energy trading market will be one of the main battlefields where the future of America’s economic dominance will be decided. Any successful attempt to delink commodity trading from the dollar will have a cascading impact not only on the global economic system as we know it but also on America’s posture abroad. 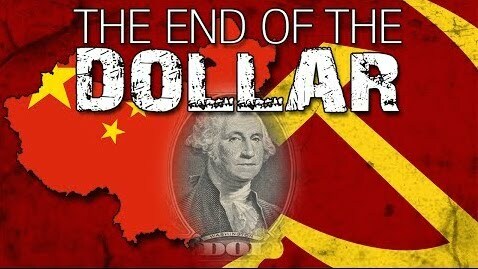 With the overall positive state of the U.S. economy and the remarkable strength of the dollar compared to the currencies of the dollar-busters including the Russian ruble, the yuan, the Turkish lira and the Iranian rial it may be easy to sink into complacency and dismiss the actions of the revisionists as mere pinpricks. But ignoring the growing anti-dollar coalition would be to America’s detriment. Bull markets eventually come to an end and with a national debt of $21 trillion and growing at a rate of a trillion dollars a year, the awakening could be ruder and sooner than most economists predict. In the midst of America’s economic euphoria it is worth remembering that one of every four people on the planet lives today in a country whose government is committed to end the dollar hegemony. Thwarting their effort should be Washington’s top national priority. The United States is currently waging economic warfare against one tenth of the world’s countries. – is co-director of the Institute for the Analysis of Global Security and senior advisor to the United States Energy Security Council. Ever since the Six Day War in June 1967, innumerable plans have been put forward from the Left, the Right and the Center about what to do with the historic land – and its inhabitants – that suddenly and quite unexpectedly fell under Israel’s control – plans regarding ways to divide sc West Bank up or annex it to Israel, without imperiling the country’s Jewish majority. A new analysis by Haaretz gives some content for implementing possible Leftist plans in West Bank. At the map by Haaretz the two-state solution could be achieved with a minimal evacuation of Jews from the West Bank. The suggested numbers are 33 isolated settlements, fewer than 10 000 families and some 46 000 people. For any Israeli government it is necessary to coordinate its actions with the mainstream settler community. According Fathom approximately 590,000 Jews living beyond the Green Line can be divided into three groups. The first group is the approximate 200,000 Israelis who live in the 12 Jewish neighbourhoods of East Jerusalem, which will undoubtedly remain under Israeli sovereignty in any agreement. The second group is some 300,000 settlers who live in the so called ‘settlement blocs,’ located west of the security barrier which are usually very close to the Green Line. The vast majority of these settlements are also likely to remain under Israeli sovereignty. Only the third group, comprising 90,000 settlers – less than 20 per cent of the entire population of those living beyond the Green Line – who live beyond the route of the security barrier, needs to be addressed at the present time. The main position of the Zionist Left has been spatial separation between Israelis and Palestinians – “they are there and we are here.”One of the first plans for the West Bank was submitted by then-Labor Party minister Yigal Allon. Allon’s basic idea was to give Israel defensible borders, while not significantly altering the demographic balance of the country. His plan called for Israel to annex most of the Jordan Valley – a ribbon some 15 kilometers in width from the Jordan River to the eastern slopes of the mountain ridge running through the West Bank – to serve as a buffer from attacks from the east. Israel would annex one-third of the West Bank, and give up the other two-thirds. The densely populated Palestinian areas from the mountain ridge to the Green Line would not be annexed, and would either form a Palestinian autonomous region, or – in a later revision of the plan – be confederated with Jordan, and linked to the Hashemite kingdom by a corridor near Jericho. The guiding principle of Allon plan, as well most plans after that, was to retain the maximum number of settlers inside Israel in the minimal amount of territory. This principle is valid also with Leftist plans during last years. Politically, the idea “us here, them there” harkens back to Yitzhak Rabin, who used that as a campaign slogan in 1992. Later former Prime Minister Ehud Olmert proposed a similar unilateral separation in the West Bank. Herzog’s plan seems likely to garner support among the centrist, center-left and even parts of the center-right Israeli voter base. ”If Israel wants to be a democratic state, which it does, then it has to either grant them full citizenship rights, which will subsequently destroy Zionism (one state for two nations) or separate from the Palestinians (two states for two nations). In that case, Israel can keep the Zionist spirit.” His steps include a halt to settlement construction beyond the main settlement blocs, passing a compensation law in the Knesset to grant generous compensation to settlers living outside the blocs who want to settle inside Israel, expanding Area B – the territory in the West Bank where the Palestinians have civil control, and Israel has security control – by another 20%, a move that would necessitate taking 20% from Area C, and the evacuation of some 35,000 settlers living in that part of Area C. Once separation is achieved, Bar-Lev hopes the sides will negotiate a final status deal. His map has Israel ceding 95% of the West Bank, and needing to evacuate a total of 70,000 settlers. by considering transferring areas east of the barrier to Palestinian control in a gradual, monitored and supervised manner. [Note that this part requires coordination and therefore is optional]. by preparing a national plan for the absorption of the settlers who would relocate to Israel proper, whether before or after an agreement is signed. Such a plan should have urban, vocational, social, psychological and other appropriate components. The alternative plans from the Right range from extending Israeli sovereignty over all of Judea and Samaria and encouraging the Palestinians there to leave, to annexing Area C, and giving the 80,000 Palestinians living there Israeli citizenship. On the far Right of the spectrum is a plan articulated by former Likud MK Moshe Feiglin, who advocates a plan for Jewish sovereignty over Judea and Samaria that includes the following: Annexing all of Judea and Samaria and making sure that Jewish sovereignty extends everywhere. The Arab population would have the following options: Either emigrate voluntarily with the aid of a “generous emigration grant”; receive permanent residency – similar to Green Card status in the US – but be unable to vote. A different approach has been proposed by Defense Minister Avigdor Liberman. Liberman advocates taking all of the land – excluding Gaza – from the Mediterranean to the Jordan and redividing it along demographic lines. In this plan, large Jewish settlement blocs would be drawn into Israel, and the area of the “Triangle” with its large Israeli Arab population would be penciled into a Palestinian state. In addition there is the maximalist alternative plans from the Right – annex all of the territories Israel gained during the Six Day War – and also the maximalist plans of the Left: a complete withdrawal from all the territories. Few Israelis, nor I, advocate such a policy, so over the years there have been numerous variations on this theme. formulation of a common vision for the federal state by establishment of a federal government, and the division of the country into 30 cantons, 20 of which will have a Jewish majority and ten will have Arab majorities (one of which will have a Druze majority). At first place the federation idea sounds interesting as it seems to solve a basic dilemma in Israeli-Palestinian conflict: how Israel same time can survive as a Jewish state, have real democracy and keep – more or less – post-1967 boundaries especially in West Bank. Sure there is also a zero-alternative, to do nothing else than keep “status quo”. This alternative, however, is leading towards undemocratic “One-state” solution, which in my opinion is one of the worst scenarios. The final status agreement has been very close at least since Beilin-Abu Mazen understandings/agreement/plan (1995) where nearly all issues were agreed; The Olmert proposal (2008) was probably the last serious try. (both plans can be found from my document library ) The parameters of the end-game have been clear the whole time but despite of a number of negotiations the final agreement is missing. In my opinion democratic One-state, Israel-Palestine federation or confederation based on cantons might work in theory but not in practice at least for decades. My argument is that even since early times of British Mandate first the Pan-Islamic and then pan-Arab rhetoric expressed fundamental ethnic and religious objections to Jews and for the establishment of a Jewish national home in Palestine. The history of repeated aggressions by neighbours have also created deep distrust among Jews about Palestinians. This kind of ecosystem and peoples’ minds are challenging to transform peaceful coexistence with eternal enemy; it might take decades and generations to change fundamental ethic values. Besides instead of Israel-Palestine federation or confederation I see Palestine-Jordan confederation much more better model. I referred two new leftist initiatives above and in my article Constructive Unilateralism: Leftist Approach to Israel-Palestine Conflict – ‘it’s in our hands’ by Omer Bar-Lev, an MK for the Zionist Union and ‘Constructive unilateralism’ by Blue White Future, leftist think tank – which both in my opinion are steps forward and also to the right direction as well including required new roadmap for better future. I don’t see constructive unilateral steps as goal but more as strategy and process which will lead towards a comprehensive agreement. The new analysis by Haaretz (How Many Settlers Need to Be Evacuated to Make Way for a Palestinian State ) gives some content for implementing these possible Leftist plans in West Bank. The map helps to prepare a national plan for the absorption of the settlers inside security barrier; it shows the settlements which will be evacuated from West Bank, it gives the numbers of settlers which helps to plan urban, social, vocational and other needs of operation and to allocate necessary funding and budgeting and all this regardless of whether an agreement with Palestinians is concluded or not.